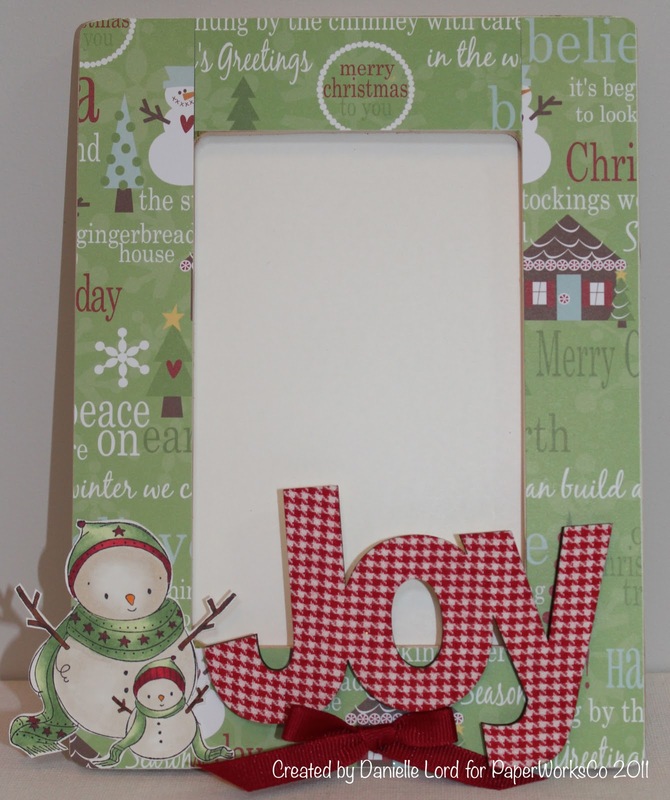 Delightful Designs by Danielle: Oh Joy! Make your Own Photo Frame! Sorry I'm late with my PaperWorksCo post .. well, in fact, if truth be told, I totally messed up! I was scheduled in to do 'Recipe Fridays' and for some reason I had 'Anything but a Card' Sundays in my head ... yes, a major oops! I guess we all have minor hiccups now and again, right? My schedule has been so hectic recently what with starting a new job etc. no wonder I had a brain fart, LOL!! Anyways, you will get to see an 'ABAC' project from me today and it's this ... a handmade photo frame. This has to be one of the easiest and cheapest gifts to make. The plain wooden frame was a $1 from Michaels and the JOY sentiment (which is also wood and covered in material) was $1.50 from Michaels too - bargains eh! I measured each of the side panels and cut a corresponding piece of paper, glued it down and sandpapered the edges. The image is RAM's 'Flaky Friends' from PaperWorksCo and coloured with copic markers. I trimmed the image out and glued it down. The final addition of a little red bow finishes off the frame. 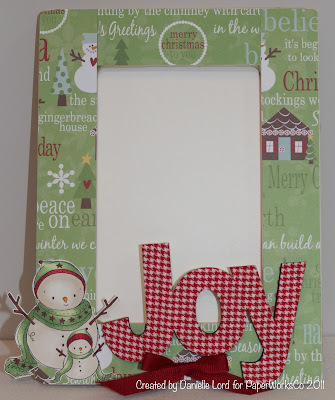 And that's it ... and handmade christmas picture frame for under $3! I plan on making some more of these ... I think they'll make such sweet christmas gifts. That's all for today folks ... I'm out of the my regular schedule at the moment so I'm not sure how much blog time I'll get but I'll try and catch up! It is Canadian Thanksgiving this coming weekend and then after that I'm back in at the Physiotherapy Clinic again (my new job) with probably more regular hours coming my way. Will keep you posted! In the meantime, hope you all have a wonderful day and a fabulous start to the week! Oh Danielle..I just love this photo frame. The red gingham is stunning I love how you placed it at the bottom and of course I LOVE the snowman. Beautiful Beautiful! Danielle what a great idea. You did such a beautiful job. Super fab my dear. Have to try this one out. Loving the frame! Can't wait to hear how the job is going when I get back to Ottawa! What a gorgeous frame Danielle!! I love the cute snowmen in the corner and the dp on the word Joy. Gorgoeus!! Great project Danielle and I love those papers. Beautiful, love the papers and the snowman is so cute.